UTComp is celebrating 10 years as a leader in composite material engineering and inspection, helping customers around the world improve the reliability of their operations. We provide a full spectrum of engineering and inspection services for composite fabrication and management excellence, including our patented UltraAnalytix™ inspection system for non-destructive and non-intrusive evaluation and service life forecasting of FRP and composite tanks, pipes and other industrial assets. UltraAnalytix™ features innovative ultrasound analysis technology to provide clients with a fast, accurate, safe and cost-effective way to assess corrosion and test the strength and condition of FRP assets throughout their life cycle, preventing catastrophic failures that endanger public safety and the environment. You get the right information at the right time to make the right evidence-based decisions. Research at leading university labs and hundreds of customer facilities has validated a number of key advantages of the UltraAnalytix™ system over other industry-standard methods. UTComp serves leading clients around the world in the chemical processing, mining, oil and gas, pulp and paper, food processing, amusement park and other industries. See all industries. We value excellence, honesty and integrity within all professional interactions. 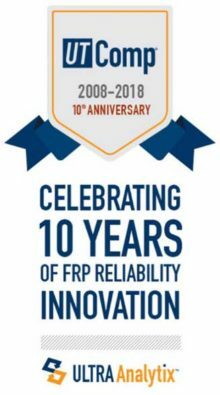 We are committed to providing engineering support and advice to customers, including owners, manufacturers and others, through the life cycle of FRP equipment, regulated safety systems and other engineering services. We will work with customers to identify needs and work to address these projects within the appropriate Regulations and design and reliability requirements. Swerea KIMAB, a qualified resource for applied research and problem solving within the materials field, with leading-edge skills within materials development, joining, component properties and materials analysis. NACE International, The Worldwide Corrosion Authority, serves nearly 35,000 members in 130 countries and is recognized globally as the premier authority for corrosion control solutions. Each year NACE International hosts many conferences and events around the world. UTComp normally attends and presents at the Corrosion Conference held in North America. Learn more about our professional accreditation and certifications.